The Best Peach Cobbler is so good and the perfect balance of flavors. 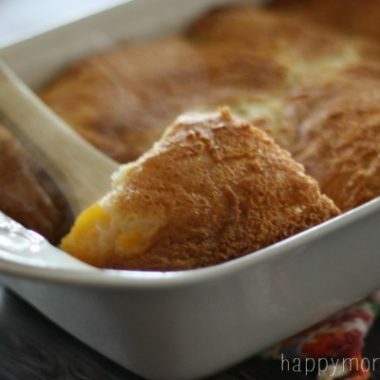 It is so simple yet so complex with the textures and flavors and it has a delicious buttery topping, a sweet center and ends with tarty peaches! cups * If using fresh peaches use 2 of fresh peaches and use only 3/4 cup of sugar. Melt butter in 8 x8 baking pan while oven is preheating. Meanwhile add last four ingredients to a bowl and mix. Mixture should resemble pancake batter and you can add extra milk if needed. Add the batter to the pan after butter is melted. Add the drained peaches on top of the batter. Do NOT stir. Bake at 350 degrees for 1 hour. Serve with homemade whip cream or ice cream! !